Autumn weddings. It’s been a lovely mix of cake toppers this autumn. (Obviously I can’t give anything away yet until the weddings are over!) But I am looking forward to sharing the latest autumnal cake toppers. I love adding the little leaves and conkers to make the cake toppers really seasonal. Autumn is becoming a really popular season for weddings, and is almost as busy as summer. The weather can still be lovely, and the natural sunlight can make a beautiful backdrop. Autumn also provides some wonderful natural colour schemes, natures pallet is very rich at this time of year. I think it also provides a great mix for your day, a bright autumnal day and then a lovely cosy evening with your guests. Perfect for a snug night with an open fire, and that is always a great excuse for toasting marshmallows. This is one of my most autumn themed toppers yet, and I loved making this one. The topper was so much fun to make. I must admit, there were lots of hours went into making and painting each leaf. That’s the lovely thing with the personalised cake toppers, because they are handmade to match, anything can be customised to match you. Reds and oranges have been really popular colours all year. Orange has been especially popular this wedding season. A lovely bright rich colour, which contrasts beautifully against a wedding dress. Red and orange is a lovely warm wedding colour, that is great to match accessories with. It is always interesting to see the patterns of wedding colour schemes matching the seasons, something I think I would do myself. Maybe I am bias as I love autumn, but I do think it is a fantastic time of year for a wedding, and an autumn themed cake topper to match! 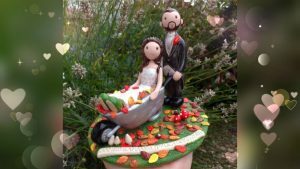 Cake toppers made to match the changing seasons are a popular choice, whether it’s spring, summer, autumn or winter there are many options for each season. At the moment I have been working on Autumnal cake toppers. It’s a fantastic time of year, the air feels fresher the colours outside are red and golden and home feels a little bit more cozy! especially the leaves, but the overall effect in the end was worth it. This cake topper has a cheeky dog stealing the grooms sock!